When we talk about disruption, innovation and transformation, what are we really talking about? Some might argue that it’s really a conversation about technology. I don’t believe this to be true. Technology (and the adoption of it) is a story that brands tell themselves as an “out” in case it does work… or in case it doesn’t work. It’s true. If things work out because you adopted a new technology, the person(s) who got it going is the hero, and the company self-praises itself for being “ahead of the curve,” “modern” or “with the times,” If things don’t work out because you adopted a new technology, the person(s) who got it going is fired and the technology is blamed on the company’s lack of innovation or handling of the transformation. It’s like blaming the broom if your office is clean (or isn’t). Hint: it’s not the broom. Bigger hint: it’s not the technology. There are six factors that brands need to be aware of at all times. It is the following six factors that competitors leverage to disrupt industry. It is the following six factors that the big players manipulate and play around with to maintain their position. These six factors are the key (regardless of what’s happening currently with technological innovations) that brands must always focus on to stay innovative, and avoid being thrust into a position of being disrupted.. and then needing a high level of transformation to maintain a competitive position (or to regain a position that they held in the past). It is also these six factors that the disruptors leverage to gain marketshare. Speed. Speed is the killer. Still, in December I published an article titled, Does Speed Need A Speed Bump? In short, too many brands are focusing on speed, when they need to be focusing more on being smarter and better. This is true. This will serve your brand well. Still, things are moving fast… and faster. The brands that are able to move quickly can (often) see more. This includes finding a possible moat or staying a few steps ahead of the competitor that is too big to move, or the competitor that is too small and doesn’t have the resources to make stuff happen quickly enough. Speed is similar to the Goldilocks zone, you want things to not be too fast or too slow, but just right. Flexibility. I’m reminded of the quote from retired United States Army general, Eric Shinseki (with a hat-tip to Tom Peters for bringing it to my attention): “If you dislike change, you’re going to dislike irrelevance even more.” Change is such a hard word for most professionals. Try on flexibility. 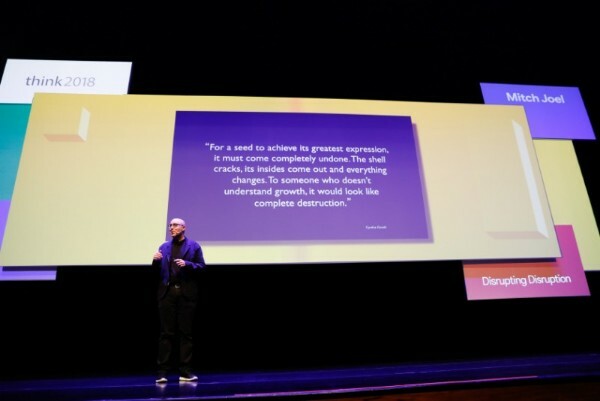 This involves avoiding new opportunities because of sayings like, “this is the way that we’ve always done it.” If you, your team and your brand can embrace the ability to be flexible daily (and you need to work on it daily to stay limber), the stiffness and inability to change is not going to set in like rust. The massive companies that have managed to ride disruption and come out of the other side have all demonstrated a degree of flexibility that their competition was unwilling to work towards. Cheaper. This doesn’t mean that your brand has to be the cheapest. This doesn’t mean that consumers won’t pay for quality or luxury. Cheaper is an attitude about how the business is operated (and the expectation of buyers). My former business partner used to talk about the margins of our business by constantly reminding everyone (from executives to entry level team members to clients) that, “it’s a business of nickels and dimes.” The brands that don’t understand how this adds up (across all the lines of business) are the ones who struggle to demonstrate profitability. Profitability should never come at the cost of value. Value is also both an internal factor (how the team feels they are being treated and the quality of the output), and an external factor (how the consumer feels about the product/service’s quality, value and utility). Never be cheaper at the sacrifice of humans, value and quality… but always work at finding a way to gather more nickels and dimes. Scale. Will the adoption of a new technology and a new way of operating give the brand more scale? Some might argue that not all businesses are looking for more scale, I might argue back then you should stay where you are, tell a better story and hope for the best. A business should see disruption as an opportunity to scale. Also, scale allows a brand to avoid disruption, because scale usually entails, new markets, new opportunities and buffers against the way the business model operated before. Data. Good data. Not big data. First party data. Not third party data. Now, more than ever, if you’re trying to avoid disruption, you must understand the data from within and the data from your consumers. In this direct to consumer brand world, one of the primary drivers that is giving these DTC players so much velocity and growth is their ability to capture, use and act on their own, first party, data. If you don’t have any first party data, this should become a top priority for the organization. First party data is (usually) one of the primary ways that the disruptors do their bidding. Connected. Be more connected. Be more connected to your team. Be more connected to your consumer. Help your consumers be more connected to your brand (and to one another). Be more connected to your industry. The more connected the brand is, the harder it will be for it to become disrupted. Warning: Be careful that one you become connected, that you stay this way. Being connected is the way a brand gets buff (a term used by Don Tapscott). Being connected is the daily weight training routine in the gym that leads to that buffness. Get connected, be buff… stay connected. Disruption is not about technology. When done well, these six factors allow brands to make their complexity invisible to the consumer. It allows brands to always be decoding the future. It allows businesses the ability to understand what’s next, while also enabling them to work with what’s now.